A grieving individual needs to know that they are not alone with the feelings that they are experiencing. 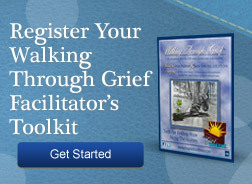 They crave information on how to navigate the grief journey, and funeral homes are in the perfect position to facilitate this. Here is where the melding of marketing and aftercare come together to aid in the healing of both the grieving individual and the bottom line. Four times over the next year we provide them with a different supportive Walking Through Grief DVD along with a card expressing sympathy and compassion from your funeral home. We do all the work - you just provide the names. Throughout all of this your funeral home is connected to the healing. Maybe you have an aftercare program, maybe you do not but it's probably not a major part of your business plan. However, you are probably spending 4% to 6% of your revenue as marketing and it is likely a major part of your business plan. Spend your marketing budget wisely, and achieve two goals in one. An effective aftercare program that builds lasting relationships with your clients.